Pan frying cavolo nero quickly over a high heat brings out its vibrant colour and flavour while retaining its robust texture. 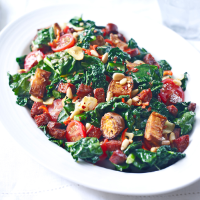 Combined with sweet potato and chorizo, this is a hearty, filling autumn salad. It keeps for a day, so makes for a good packed lunch too. 1. Preheat the oven to 200 ̊C, gas mark 6. Toss the sweet potato with 2 tsp oil and the paprika; season. Roast for 20 minutes, until just tender and golden. 2. Meanwhile, put the chorizo and remaining 1 tsp olive oil into a large frying pan and set over a medium-high heat. When hot and the chorizo has released some of its oils, add the cavolo nero stalks. Fry over a high heat for 2 minutes, then add the leaves and fry for a further 5-6 minutes, turning frequently, until the leaves are crispy and slightly charred. Add the chilli and garlic and stir-fry for a further 30 seconds. Remove from the heat, mix in the balsamic vinegar and season well. 3. On a large serving dish, mix the cavolo nero with the roasted sweet potato, pine nuts and tomatoes. Sprinkle over the dried chilli flakes and serve immediately.